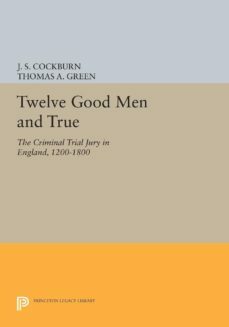 Twelve Good Men and True brings together some of the most ambitious and innovative work yet undertaken on the history of an English legal institution. These eleven essays examine the composition of the criminal trial jury in England, the behavior of those who sat as jurors, and popular and official attitudes toward the institution of jury trial from its almost accidental emergence in the early thirteenth century until 1800. The essays have important implications for three problems central to the history of criminal justice administration in England: the way in which the medieval jury was informed and reached its verdict; the degree and form of independence enjoyed by juries during the early modern period when the powers of the bench were very great; and the role of the eighteenth-century trial jury, which, although clearly independent, was, by virtue of the status and experience of its members, arguably a mere extension of the bench.This extensive collection marks the first occasion on which scholars working in several different time periods have focused their attention on the history of a single legal institution. Written by J. M. Beattie, J. S. Cockburn, Thomas A. Green, Roger D. Groot, Douglas Hay, P.J.R. King, P. G. Lawson, Bernard William McLane, J. B. Post, Edward Powell, and Stephen K. Roberts, the essays utilize sophisticated techniques to establish from a variety of manuscript sources the wealth, status, and administrative experience of jurors.Originally published in 1988.The Princeton Legacy Library uses the latest print-on-demand technology to again make available previously out-of-print books from the distinguished backlist of Princeton University Press. These paperback editions preserve the original texts of these important books while presenting them in durable paperback editions. The goal of the Princeton Legacy Library is to vastly increase access to the rich scholarly heritage found in the thousands of books published by Princeton University Press since its founding in 1905.